TALLAHASSEE, Fla. -- The gunman who shot three people at Florida State University's library early Thursday before being killed by police was a former student, a law enforcement official told CBS News. There is also indication, according to police records in New Mexico that he was mentally distressed. Officials said the shooter was Myron May, 31, CBS News senior investigative producer Pat Milton reports. Police officials later confirmed the name to the media. 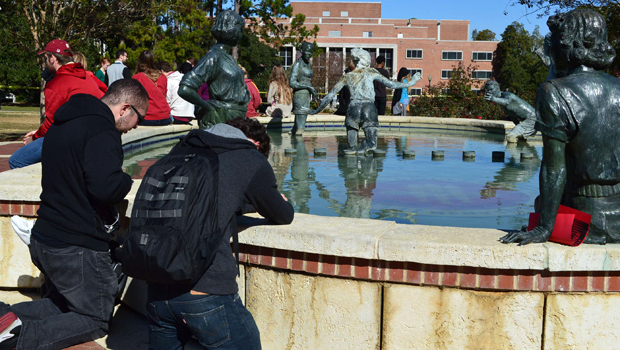 May was fatally shot early Thursday after he shot three people at FSU's Strozier Library. Two are hospitalized and one has been released. One of the victims was identified as Nathan Scott, a library employee. He was shot in the leg but is listed in good condition. The names of the other two victims have not been released. At a Thursday afternoon press conference, Tallahassee police chief Michael DeLeo said May graduated from Florida State in 2005 and Texas Tech Law School in 2009. He had recently moved back into the area about three weeks ago. Officials know of no motive May would have had behind the shooting, but DeLeo said May had journals and videos saying he feared being targeted and wanted to bring attention to it. There was no indication that the three people who were shot were specifically sought out. "We have no information saying anyone was targeted for a specific reason," said DeLeo. However, last month an ex-girlfriend called police on May saying he was harassing her. The woman said May, who was living in Las Cruces, N.M., had developed a severe mental disorder, according to a police report, believing cops were after him, bugging his phone and putting cameras in his car and home. She said May had been diagnosed with ADHD and was taking prescription medication for it; but the affliction had worsened over the prior few weeks. Police attempted to check on May at his home but he was not there. Future police checks on May were pending, according to the report. In an earlier incident in September, May complained to police that he thought he was being watched and that he believed surveillance cameras were in his residence and that he constantly heard voices coming through the walls talking about his activities. But he did not provide any evidence of the voices to the responding officer. DeLeo said May moved back into the Tallahassee area about three weeks ago. Abigail Taunton, who runs a foster home in the Florida Panhandle, told The Associated Press that May had recently been staying at a guest house she owns. She said police interviewed her husband, David, after the shooting. "He's just a boy our kids grew up with that we let stay in one of our guest houses for a while," she said. "He's moving back home from Texas and we were trying to help him get on his feet. Tallahassee police have no criminal record of May, but as a Florida State student in 2002, he was investigated for suspicion of marijuana use by FSU police, authorities said. He was not arrested in that incident. "He was a well-liked, real smart. He was having some financial issues and moved back home and decided he'd come back to Florida to work," she said. "My heart's broken. In a million years I wouldn't have thought he'd do something like this. He was struggling, having decided that what he was doing out there was not good. He had some issues and just decided he'd come home. He was struggling, like we all do, financially and otherwise." The shooting happened about 12:30 a.m., sending hundreds of students who had been up all night studying for exams scrambling for cover in the book aisles and barricading themselves in with desks. Two students and an university employee were wounded before police killed the gunman in a shootout, authorities said. Police and FSU officials called the shooting an "isolated incident," but have not released many details, including how far May made it into Strozier Library. FSU's compact campus is located less than a mile from downtown Tallahassee and the state Capitol. "No one really moved," student Dominique Gamez told CBS News. "It wasn't until the guy was on the floor and he had his hand on his leg and right there everyone just started running ... I wish I would have stayed with the guy and kind of asked him about it, but at the time everything's happening so fast." "Everyone, including myself, is just taken back by it," student Matthew Paskert told CBS News. "... You hear about it happening, but you never expect it to happen to you or to people you know." A local hospital, Tallahassee Memorial HealthCare, told CBS News at least two victims were brought there. The hospital said one victim was in critical condition and the other had improved from stable to good condition. FSU officials said a third student was only grazed by a bullet and was treated at the scene and released.